Andruski) resides in Edmonton, Alberta. Rolland took over the family farm and resides there in the Hythe area. Eric passed away in the spring of 1983. John Krog was born in Trondheim, Norway, on February 17, 1824 and emigrated to the United States about 1854. There he married Petrina Flom. 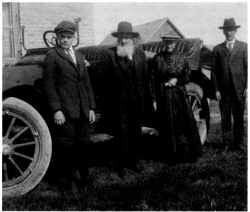 In 1888, they came to Manitoba from Lake Mills, Iowa, with their two daughters, Bertha and Johanna, and three sons, Andrew, Peter and Joe. They settled in the northern part of the Danvers district. Their plan was to attempt ran­ ching rather than farming so the meadowlands along the Whirl Pool and Rolling Rivers seemed a good choice. They acquired land on both section 28 and 34, 18, 18, and later a quarter in the unorganized territory to the north. Andrew, who was twenty-three at the time, told in later years that they were required to unload and reload their machinery at the Canadian - U.S.A. border. They brought four horses with them but purchased several head of cattle from Nathan Barnes north of Elphinstone at a price of twenty dollars per head. These were being pastured to the west but grass fire necessitated bringing them to the Round Lake flats. Again fire destroyed the grazing ground and they had to bring them home earlier than intended. Apparently they were successful in this venture. Bertha married Chris Orton and they farmed on N .E. 17 -18-18. She died while still quite young and he returned to the U.S.A. Johanna also returned to the U.S.A. where she lost her life in a fire. Peter Krog became a grain buyer in one of the Clanwilliam elevators. About 1920, the senior Krogs with Andy and Joe moved to the state of Washington to start again. However they returned to their property in Danvers because, as Mrs. Krog ex­ plained, "It was just as hard work there as here." 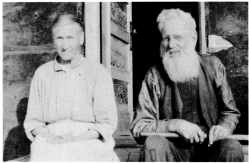 Joe married Camilla Christiansen and they farmed in the Clear Lake area for many years. hearted man, willing to lend a hand when needed. He died in April, 1959, at the age of ninety-two and a half years. They are buried in the Bethel Cemetery. Oliver, John, Petrina and Andrew Krog. Peter, affectionately referred to as "Red Pete", was born in Poland on July 10, 1910. Both parents died when he was very young and so he made his home with his grandparents. When he was seventeen he came to Canada and lived with Uncles Steve and Harry Shewchuk on a farm at Ozerna. He worked at Newdale and various points in Ontario before returning to Ozerna, where he took up farming. On November 9, 1941, he married a neighbor girl, Rose Wolski, who had been born in Oakburn on April 15, 1920. They farmed at Ozerna for two years and then they and Sophie, Rose's sister, and Joseph Norosky, bought a half section of land from Jim Coey in the Clear Lake district. The house was very small, but the four lived together for a year and then Joseph and Sophie moved to their own farm nearby, which was originally owned by Albin Gustafson. The sandy land on the farm didn't produce heavy crops and so their main livelihood was gained from selling gravel from their pit, cutting logs and sawing them into lumber at Albin Gustafson'S, Skog brothers or Bill Slashinsky's mills, and raising up to one hundred head of cattle. Elk and deer abounded around their property. They tried to raise chickens, turkeys and ducks, but many times the coyotes got the largest share. The creek that ran through the property supplied all the fresh fish needed for their meatless days.